"The Bureau of Justice Statistics recently released its online Prisoner Recidivism Analysis Tool. The Tool is the first in a series of data analysis tools that will enable the public to explore the recidivism patterns of persons involved with the criminal justice system. Users can conduct customized analyses of the database, which includes the recidivism of prisoners released in 1994 and followed for a three-year period after release. Other attributes include gender, age at release, race, Hispanic origin, commitment offense, sentence length, prior arrests, and prior commitments. The Bureau of Justice Statistics will update the tool in 2012 with new recidivism data on prisoners released in 2005." Data can be downloaded into Excel or PDF. The Inter‑university Consortium for Political and Social Research (ICPSR) is pleased to announce the 2011 Summer Program in Quantitative Methods of Social Research. Most courses for the ICPSR Summer Program are held on the campus of the University of Michigan, in Ann Arbor. Lectures and workshops on a wide variety of topics in research design, quantitative reasoning, statistical methods, and data processing are presented in two four‑week sessions. The first session runs from June 20, 2011 until July 15, 2011. The second session runs from July 18, 2011 until August 12, 2011. The contents of the two sessions are largely independent of each other, although some second‑session workshops do assume that participants are familiar with material from first‑session courses. The 2011 ICPSR Summer Program will also offer a number of three‑ to five‑day workshops on both statistical and substantive topics throughout the summer. Most of these shorter workshops take place in Ann Arbor, but there are several that will be held in other locations: Amherst, MA; Bloomington, IN; Chapel Hill, NC; and (for the first time) Berkeley, CA. Check out this interesting post on mapping America from Remapping Debate, an online public policy journal. They've teamed with Social Explorer (a data visualization database) to create maps using data from the recently released 2005-2009 American Community Survey. 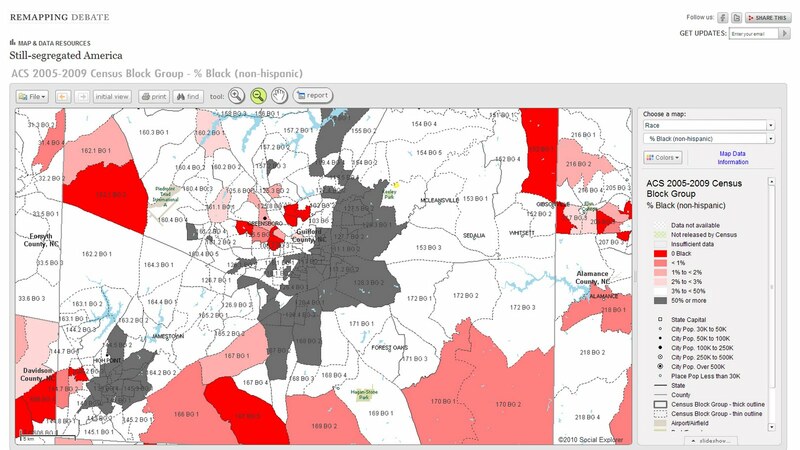 At UNCG we have access to another mapping database called SimplyMap that does similar mapping. These are great tools for visualizing your community! ICPSR has a webinar on data management plans coming up on February 17. I encourage all researchers to "stop in". It is an excellent presentation! This webinar is a repeat of the January 12, 2011 session. The same topics and discussion will be covered. The webinar is free and open to the public - please forward this invitation to any who may be interested.